Chinese stocks are on a tear after shrugging off a poor start to 2013 as fears of an economic slowdown receded. Whether the rally can continue through the end of the year may depend on big policy decisions expected in November. For much of the first half of the year, China's main indexes took a beating as investor appetite soured over concerns about the prospects for the world's second-biggest economy. Only the tiny Shenzhen market managed to buck the trend, thanks to the predominance of small technology firms with high growth potential. But Hong Kong's Hang Seng and the Shanghai Composite bottomed out in late June and have surged by about 18% and 12% respectively since then. And the Shenzhen Composite has continued its push higher, gaining 20% over the same period. "Market sentiment has been recovering slowly from its trough in late-June," said Barclays economist Jian Chang. "Economic data has been stronger than expected." The latest sign of a recovery came Monday, when HSBC's "flash" measure of manufacturing purchasing managers' sentiment hit a six-month high. That followed a slew of positive economic data, including strong industrial output, robust trade and moderate inflation, raising confidence that China is back on track to meet its 7.5% growth target for the year. Chinese stocks also got a boost when the U.S. Federal Reserve unexpectedly announced last week that it would continue its $85-billion a month bond-buying program, putting off the moment when it will start pumping less money into markets. Despite the third quarter rally, Chinese stocks are still lagging other major world markets so far this year. 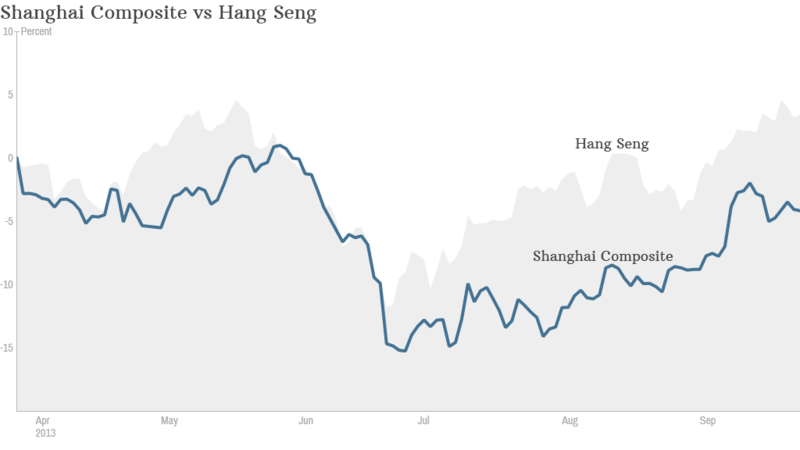 The Hang Seng is up about 2%, while the Shanghai Composite is still in negative territory. By comparison, the S&P 500 is up 19%, and Germany's DAX almost 14%. And some experts are reluctant to predict further gains in China this year, given uncertainty about future economic policy. Right now, China has "a window to perform" said Joseph Tang, an investment director at Invesco. Whether or not growth is sustained -- and stocks continue to rally -- may well depend on the kind of reforms adopted at a meeting of China's Communist Party leadership in November. Nomura economist Zhiwei Zhang said new monetary policies could slow China's building economic momentum as the government moves "to shift its focus away from the speed of growth, towards efforts to rebalance the economy and improve the quality of growth." China's recovery is unlikely to be sustained going into next year, he said.